In the final of the ABN AMRO World Tennis Tournament, the great Roger Federer added to his vast collection of titles by defeating Juan Martin del Potro 61 64 in very convincing fashion. It was the 71st title of Roger's career, and he capped off a great week in Rotterdam by playing his best tennis to win the same title that he won seven years ago, the last time he played the event. After Federer's incredible comeback win against Nikolay Davydenko in the semifinal, it was without question that he would need to play much better if he wanted to defeat the surging Argentine in the final. From the very first point, it was evident that Roger was at his elite best. Unlike the semifinal, where his groundstrokes were shaky, he was hitting his forehand and backhand with equal confidence and spreading the court, continually keeping del Potro off balance. The Swiss saved a break point in the opening game but past that, he rolled to a 5-0 lead by showcasing his dominant authority from the baseline. This was mighty impressive against a monster power baseliner like del Potro. It was vitally important that Roger was sharp from the ground because Delpo saw many 2nd serves as Fed was struggling to put his 1st serves in play. 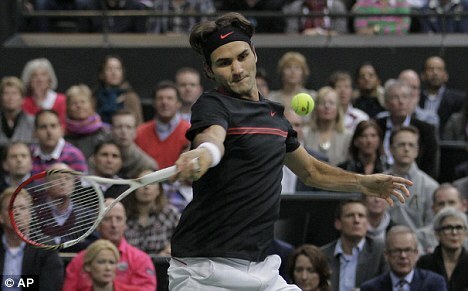 The Argentine got one game to the pleasure of the Rotterdam crowd, and then The Mighty Fed held to take the set 6-1. The second set was much closer, understandably. The first set was almost too easy for Federer. Del Potro did not play poorly, but Roger was too good, almost too good to be true. Del Potro started the set well, holding his first two service games to take a 2-1 lead. He had a break point opportunity to take control of the set in the next game, but Roger denied him. Then, as often happens when one cannot convert on a break chance, Delpo gave up the break the very next game and Roger took a 3-2 lead. Assumedly, this was the crucial break that Federer needed to ride out the match, but it would not be that easy. He saved a break point at 3-2, and then at 4-3 he saved two break points, fighting out of a 15-40 hole, and held to take a 5-3 lead. Del Potro was fighting very hard and he gave Roger everything he could handle with his massive baseline shots. Roger was up to the challenge though and was able to weather the storm with some brilliant baseline play of his own. This was vital as his serve was still not clicking, so when Delpo was pressing he could not get many free points off the serve. Anyways, Federer took the first match point he had at 5-4 to seal the deal, defeating del Potro 61 64 in one hour and 26 minutes. It was a near flawless match from Federer, with the only real blemish being that he only got 49% of his first serves in play. However, in the end it did not matter because Roger was controlling most of the baseline rallies and was razor sharp on both the forehand and backhand wings. His mental strength was also on display, especially in the second set when he saved many break points when the Argentine was doing all he could to get a break back and keep his hopes alive. Overall, Fed saved all 7 break points he faced and converted 3 of 5 of his own chances. Those numbers are a formula for success as evident by the result of this match. I could not be happier for Roger and I am so happy that he saved his best tennis for the final match and won his 71st career title! 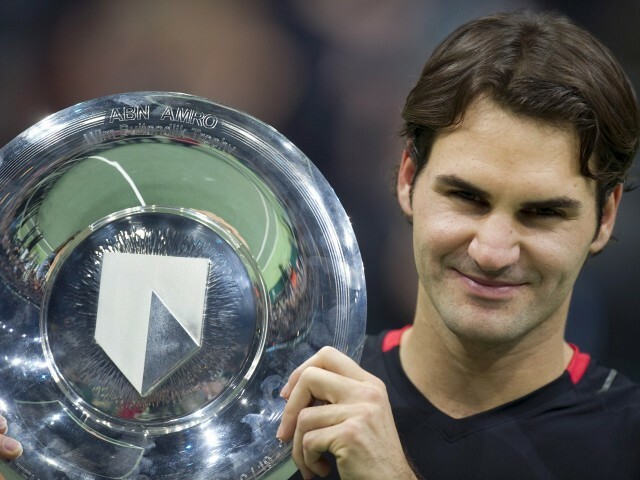 At this stage in his career, every title he wins is special, and after a seven-year absence from Rotterdam, Roger seemed genuinely happy to win the title. He noted in a post-match interview that he thought the crowds were fantastic all week long, giving him standing ovations as he arrived on court and left the court after his contests. Fed also reciprocated the warm reception on his day off (walkover in the 2nd round against Youzhny) by playing two super tiebreaks against Dutch player Igor Sijsling, which gave the fans in attendance who had been there to see the great man the chance to. Roger understands that he is the most popular player on tour and he completely understands how many people admire and respect him. That he went out of his way to play any tennis at all on his day off just shows what a great sportsman he is and how lucky we have been to have him as an ambassador of the sport. Federer's next event is in Dubai, where he is the returning finalist. Last year he lost to Novak Djokovic in straight sets, and this time around he will want to win the title. He will certainly have no limits on confidence after a great week in Rotterdam. It was not an easy week by any stretch of the imagination; his first round match against Mahut was close. His quarterfinal clash against Nieminen was tight. He nearly lost the semifinal against Davydenko and showed tremendous heart to win, and then finally in the final he played his best, and thankfully at the right time. I think Roger will take many positives from winning this Rotterdam title, not just for his next tournament, but maybe even for the rest of the year. He proved that he could win without being the better player on the court (vs Davydenko), and he also showed more emotion than usual, letting on many guttural yells at crucial times in his matches. I can only think that all of those signs are really good heading into the spring towards the next Grand Slam, the French Open. But as for right now, I'm going to enjoy Roger's fantastic triumph as a fan and kick my feet up for the next week watching highlights over and over again. Well, I actually do that constantly anyways, but who wouldn't want to watch the Maestro at work? Enjoy the win Federer fans, and I'll write soon. I'm chuffed he bagged this one even though I wasn't hanging all my hopes on it.